After seeing (and sharing with you) Jacqueline’s lovely little embroidered E, I find myself more in love than ever with this particular monogram alphabet! I’m looking forward to taking some time to work some of the letters in the near(ish) future. 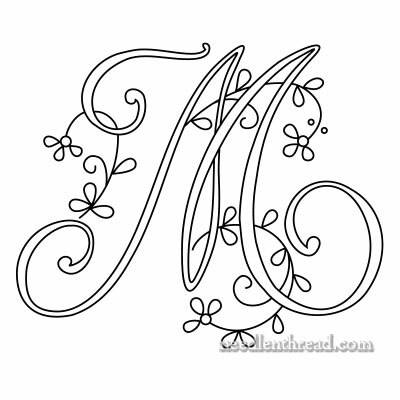 Monogrammed items make perfect gifts, and I’d like to monogram some gifts for Christmas this year. That’s the plan, anyway. And that’s one of the reasons I’m pummeling you with a set of three letters each week – when I do get to the point of working some of the monograms, I want you to have access to all the letters, too. Today, the next set of three letters: the M, N, and O. In old publications that featured alphabets to use for monogramming, the M was often present, but the W was left out. On this alphabet, if you flip the M over and remove the small swirl on the top right, you’ll have a pretty good W.
1. Printing was more expensive back in the day. Making an alphabet as compact as possible to fit on a printed page made sense. Eliminating a number of letters that could be adapted from other letters in the alphabet was a good way to do this. Why print the same form (or almost the same form) twice? That space could be used for something else. 2. Have you ever tried to create a balanced layout with the full 26-letter alphabet? It’s not easy. Eliminate two of the letters (especially a space hog like the W), and with 24 letters left, it’s much easier to create a good looking layout! 3. I’ve mentioned this one before: in some languages, you simply don’t see names beginning with certain letters as frequently, so the need for those letters was not as pressing. W, for example, is not a very common initial in French names, and neither is I. I’m sure names beginning with these initials exist, but they are nowhere near as common as the M or the R, for example. Those are three common sense explanations for missing letters that come to mind. If you know of any others, I’d love to hear them! 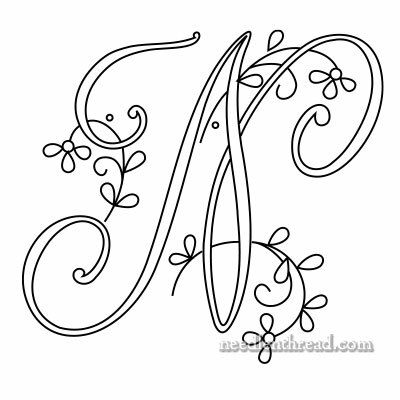 Here are the PDFs for today’s monograms. The letters will print at 1.5″, 3″ and 4″ high if you choose no scaling (or a similar setting) on your printer. You can enlarge and reduce them by using the scaling feature on your printer or by using a photocopier. I never realised the reason for the missing letters in alphabets, interesting. As you say these would make lovely gifts on all manner of fabric from tea towels, hankers, napkins, towels etc, the list is endless and this set of monograms could be embroidered in so many different ways. Thanks for sharing these with us. I hope you had a great 4 July celebrations. I thoroughly enjoy your posts. Every day I wait to receive my email so I can see what goody you present. My sweet grandma taught me to embroidery when I was about 8 years old. She was an extraordinary stitcher. I became intrigued with needlepoint and then doing crewel stitches on my canvases. 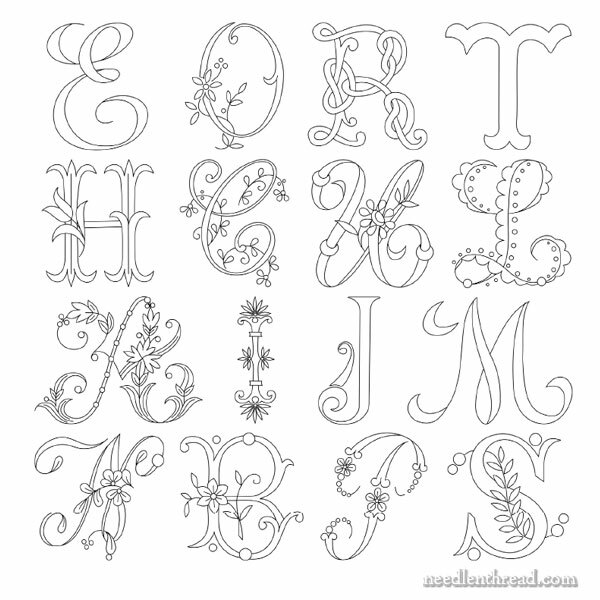 However, I am inspired by your blog and am determined to do these beautiful alphabet letters for Christmas. I’ll let you know how it turns out! Thanks and keep up the good work! I have a diary from the late 1800’s into the early 1900’s and it is very difficult to read. The reason–so many of the letters look the same. Their “I” and “J” were interchangeable. Maybe this is the reason for leaving the “J” out of monograms. I just got back from visiting family and could not help but think of you this morning. While home, I was given the honor of helping to clean out my 94 yr. old mother-in-law’s sewing room. She had recently moved into a nursing home and I am the only one in the family who still sews or embroiders. I found dozens of English needles still in their original cards from the 1940’s and 50’s. So many pieces of crocheted and tatted lace and collections of hand embroidered table scarves and tea towels and pillowcases. I left most of them for family members to sort through in case my nieces wanted a keepsake from Grandma. Thee was vintage chicken scratch aprons and one apron that I had made many year ago. Most of the vintage thread is not useable, but darning threads, yarns, crochet threads, tatting threads and sewing threads still on wooden spools were every where. I kept enough samples to share, but had to let the rest go. The vintage patterns for monograms are still in good condition and the peg board Dad had made to hold moms sewing thread was still there. I love this alphabet and I love the idea of monogramming but here’s the thing. Exactly what items do you stitch these onto? When you said that you were going to put them on gifts, what would that be? Are there certain items that work better than others? I’m alone?… Well, Thank you, thank you and thank you for this monograms and print easy. Yeah! I’ve. Been waiting for the M for a project I want to do! Thanks for all you share with us! One of my embroidery alphabet books states in the introduction that letters such as I, Q, and sometimes W were often omitted because they could be replaced with a J, O, or an inverted M during actual embroidery. ‘One Hundred Thirty Antique French Embroidery Alphabets’ by J.F. and F.A. Shepard. (c) 2008. I have often wondered why certain letters were missing from alphabet sets, so it was interesting to read your take on the reason. Thanks for the info! Perhaps this all stems back to Latin, where the letters J and W did not exist. The development of illuminated manuscripts in the Middle Ages with initial letters of each page or paragraph beautifully presented in colour and gold leaf form the basis of the concept of monogramming. These original texts were of course in Latin, so J and W were not present. Many European languages influenced by Latin have these letters included only in later centuries, through the adoption of words from indigenous languages, like Celtic and Anglo-Saxon, from foreign conquerors, and from changes in pronunciation. The history and development of language is almost as fascinating as embroidery! I think your reasoning makes sense for the missing letters, but it still seems a bit odd for an English Alphabet. Oh well, the truly important thing is that its BEAUTIFUL! I have re-discovered my love of needlework as it has been many years since I took my needle in hand. I just found your site and I love it. It is packed with so much valuable information and has increased my desire to begin stitching again. In fact I am currently stitching your pattern “Delicate Spray in the letter M” on a burlap table runner I made. Thank you again and be blessed as you stitch! Thanks, Amy! 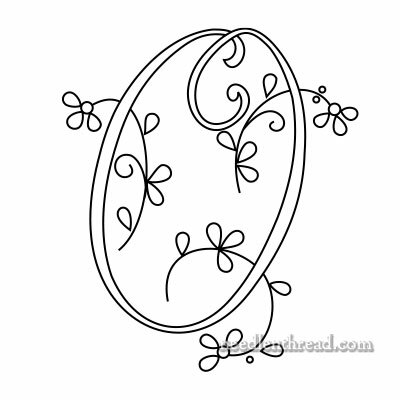 I’m so glad you are stitching again – and that you’re using the Delicate Spray alphabet. It’s one of my favorites! If you take any photos of it finished, I’d love to see it!